The epitome of the American adoption of Art Deco, in particular its interest in mechanical aesthetics, is mostly clearly seen in Raymond Loewy (1893 –1986). With work ranging from window designs for major department stores to helping design the living quarters for astronauts, Loewy influenced near enough every corner of American life. The clean lines and streamlined style came to embody the design of many products and can even be seen today in the transition into the clean aesthetics of many modern products. In the early 60s it was decided that the presidential aircraft should become a more formal mode of transport. The initial designs had the plane designed with a livery of gold and red but it was felt that this was too regal and not representative of the United States. The first lady, Jacqueline Kennedy, suggested Loewy help in designing the plane on both the inside and out. Loewy chose to leave parts of the fuselage as bare metal and coupled it with two tones of blue: a classic presidential blue and a more modern cyan to represent the future. 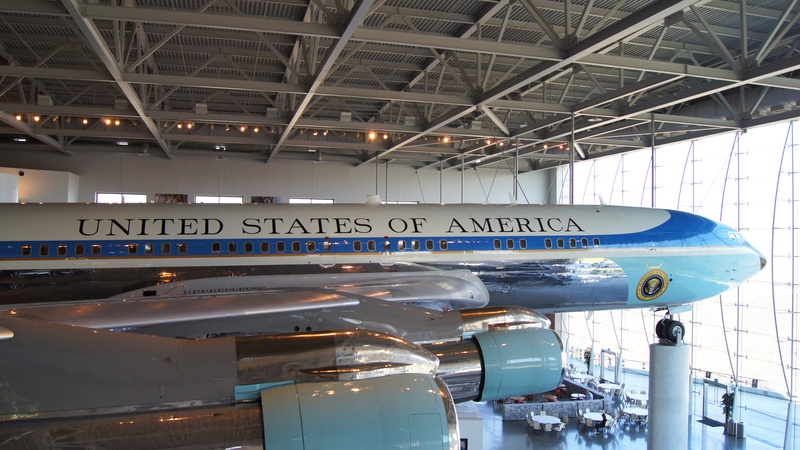 The design became so synonymous with presidential travel that it is still used today. This was not Loewy’s only foray into transport design. He famously designed trains and cars but also the Greyhound bus. His sleek and modern designs for the Greyhound bus coincided with its explosion in popularity as highways more easily connected cities and people wanted to travel more. They came to represent travel in America and near enough everyone had seen Raymond Loewy’s buses going through their town. Few things represent the United States more than Coca-Cola. It is available in all but two counties in the world; North Korea and Cuba being the only ones to not import it. There is a long held story about Loewy being the designer of the original glass bottle but this is not true. He loved the design and claimed it to be one of the best designs for a drinks bottle ever and this confusion may come from his designing of other bottles for the Coca-Cola Company, like the one for Fanta. He did add the white writing on the cola bottle where before it had been just glass relief but the story of him designing the whole bottle is sadly not true. 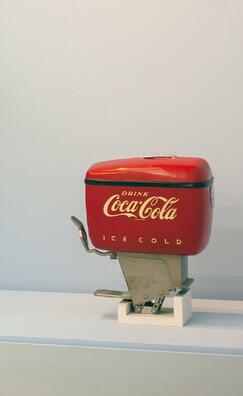 However, he did design and re-design many other things for the company like their delivery trucks but most famously the Dole Deluxe fountain dispenser. Not only was his design more streamlined in its look but also in its function. It managed to pour more servings per gallon of syrup with less waste. This value that was placed on function was very important to American modernism and the wider art deco industrial designers. It wasn’t just about beauty it was about making something that also functioned better than previous incarnations. This can also be seen in his earlier transport designs and their low air resistance bodywork. 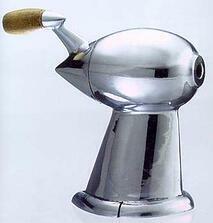 Loewy’s pencil sharpener is an oddity in his catalogue of work. It was designed to look futuristic and represents the epitome of the American industrial art deco style: it was simple and clear. There was a hole at the front, a crank at the back and the shavings were collected in its base to be emptied when it was full. Beginning with this simple function and basic mechanism, Loewy then chose to make a design that was intended to make people want to display it. Its function, he said, was intended to justify its form and as such, its purchase. Loewy didn’t understand why something that sits on your desk and that you see all day shouldn’t be beautiful and his design shows this. The result is a beautifully shaped, almost space age, pencil sharpener. As simple as the mechanism design was, the ostentatious look was a little ahead of its time. Designed in 1934, it was sadly never put into production but the prototype did sell at auction in 2001 for $85,000. Loewy’s designs shaped American culture. His combination of clean art deco lines, industrialism and function represented the direction that modern America wanted to go. Designs that improved upon the function of current ideas or products while also paying attention to the aesthetic quality of an item. 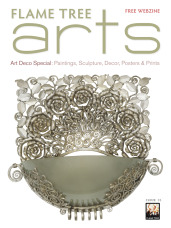 This post is based off extracts from our book Art Deco: Masterpieces of Art (ISBN:9781786648006). This title is part of our Masterpieces of Art series which is packed, with tonnes of information and beautiful images. You can order it from our website here or on Amazon here.